Mia got her first ride in a Cozy Coupe while visiting Mima and Granda's on Thanksgiving day. I wasn't sure what kind of reaction I was going to get, and I'm still not really sure there was one. I mean, she didn't cry, but she didn't squeal or giggle either. She just quietly took in the scenery as I gently pushed her around the room and spotted her as she teetered in the seat. But then, I took a look at one of the photos I got of her while she was stationary. The concentration. The perfect grip on the wheel. This is a child who is still perfecting the grabbing of food and placement of it in her mouth, but boy- can she steer. Fast-forward to a few days ago, when I stuck her in the seat of Michael's little fire truck on a whim. With one hand on her waist and the other on the back of the truck, I sent her scooting around the basement. This time, she began to wave her little hands in glee. 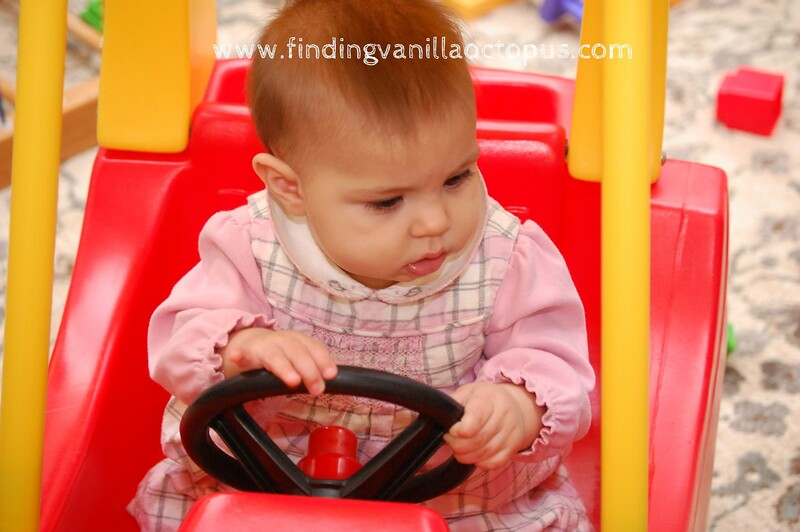 That is, until she noticed the steering wheel. Though the fire truck's wheel does not actually turn, she reached for it anyway and alternated drumming on it playfully and grabbing the edges as though she were the one driving. It occurred to me in that moment that perhaps there's a bit of a thrill-seeker in her, yet. Good thing we've got nearly sixteen years before I have to worry about her in the driver's seat of a real car. Too bad the day will be here before I know it.